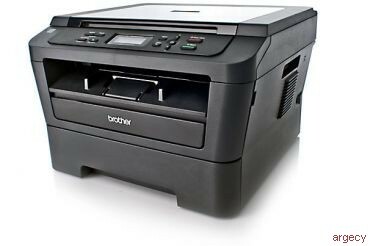 The Brother HL-2280DW is a versatile monochrome laser printer that features fast printing at up to 27 pages per minute, plus convenience copying and color scanning capabilities. It also offers automatic duplex printing for producing professional two-sided output and built-in wireless and Ethernet interfaces for sharing with others on your network. The HL-2280DW provides flexible paper handling via an adjustable, 250-sheet capacity tray, and its stylish, space-saving design fits virtually anywhere. To help lower your operating costs, a high-yield replacement toner cartridge is available. Flexible connectivity. Built-in wireless 802.11b/g and Ethernet interfaces to share with others on your network. Eliminate extra cables and conveniently place your printer with wireless networking or connect locally to a single computer via its Hi-Speed USB 2.0 interface. Flatbed copying and scanning. Use the document glass for convenience copying or high-quality color scanning. Offers an up a 19200 x 19200 dpi (interpolated) resolution and a variety of "scan-to" features. Fast, high-quality output. Help improve your productivity with a print speed of up to 27ppm and produce professional output at up to 2400 x 600 dpi. Convenient paper handling. The HL-2280DW can meet all of your printing needs via an adjustable, 250-sheet capacity paper tray that handles letter or legal size paper and a manual feed slot for printing envelopes and letterhead. Outstanding customer support. The Brother HL-2280DW offers a 1 year limited warranty with free phone support for the life of your product. Carton Dimensions (W"xD"xH") 20.7" x 20.1" x 17.3"
Unit Weight (lbs) 22.7 lbs. Carton Weight (lbs) 27.8 lbs. Nuance PaperPort 12SE supports MicrosoftSP3 or higher for WindowsXP and SP2 or higher for Windows Vista, Windows 7, and Windows 8. "In-Box" Consumables (Yield) Approximate toner cartridge yield in accordance with ISO/IEC 19752 (letter/A4). Drum yield is approx., and may vary by type of use. Mobile Device Compatibility Requires connection to a wireless network. Cortado is a trademark of Cortado AG.